Occidentalism » Blog Archive » Has Oshima had enough? 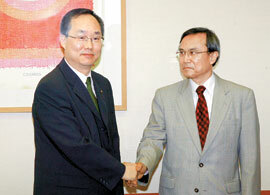 Oshima, the Japanese ambassador to Korea has had to deal with a lot from his counter parts in Korea. They really don’t treat him well; I would have gone home by now myself, but he’s a bigger man then me. But he looks pretty pissed in this article. Even if you joke he’s silent … Japanese ambassador Oshima. “I’ll tell you how things are going! You’re little friend to the North is firing missiles at us and you’re telling us to calm down and now your making jokes! That’s how things are going! You wanna talk about 歴史認識, how about we talk about you’re mental disorder 認識! !” … Is what I think he meant to say, but I could be wrong. Perhaps that’s why I’m not an ambassador. The article complains that when the Korean ambassador greeted Oshima in English, he just nodded his head as to say, “whatever” and sat down. When a person who normally doesn’t get angry displays his anger quietly it’s scary…. Too scary. 認識 [にんしき] (n,vs) recognition, cognizance, cognisance. – It had a much better flow to me in Japanese then a bumbled English translation. Japan should just politely and quietly take it, as always. And in the mean time take the pacifism stuff out of its constitution and rebuild its military. Wait Wait, I got it…no I lost it. Sorry. Your post reminds me of talking with a member of the US Embassy last year during the last major Dokdo/Takeshima flare-up. Apparently both missions share a certain amount of gallows humor in trading off the riot police ringing each other’s embassies. That is a wonderful, wonderful photo. South Korea has major problems. They say they hate the Japanese but at the same time, buy so many Japanese products. Koreans living in the U.S., practically own only Japanese cars and Japanese electronic goods. Do they not know that they make Japan rich and not help improve their own country??? Duhhh… Japanese don’t buy Korean cars or Korean products…..